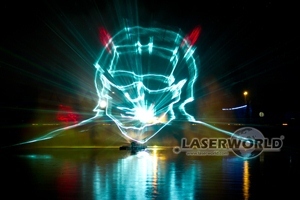 Show lasers generate exciting illusions when combined with water effects. The light refraction in the water drops give a vividly impression and suggest kind of tree-dimensional projections. Water screens are usually used indoor for generating a projection surface that can be easily and quickly switched on and off. Water screens provide a curtain of a multitude of water drops falling downwards. The sreecn consists of the actual water screen element with rows of nozzles that are in very close distance to each other, a strong pump with a special hose and a water basin. To have more depth in projection surface and a better "resolution", water screens usually have two or three nozzle rows. The more nozzle rows, the more water density in the actual projection surface. Water screens are ususally used to project on with video and/or lasers. There are also solutions that use the water screen as effects element itself, however this is a very rare kind of application. More advanced water screen solutions are graphics capable themselves, meaning the water drippling from the single nozzles can be controlled to generate text or patterns of water falling from top to bottom. Together with lasers this creates amazing effects!. Water shields work the other way round than a water screen: They are generated from the bottom upwards. Water shields consit of the shield element and an extremely strong pump. As the effect spreads up quite wide, it is used in large water basins only - artificial or natural (like lakes, rivers etc.). 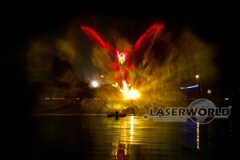 Water shields are perfect surfaces to project large scale video and laser images on. 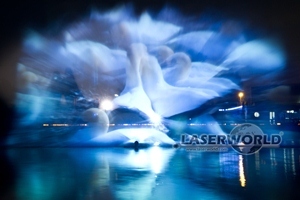 As they can spread up to 70m width (depending on the model type), they are used for large scale multimedia shows. The advantage of water shields over solid projection surfaces is the ability to suddenly emerge on a stage or scene and disappear the same speed. The surface refracts the light in a way that a 3D-like effect arises. 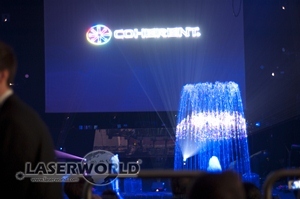 Nearly every larger multimedia show uses water shields as temporary projection screens. Water fountains, or water jets, are used to extend outdoor scenes in height and to attract the spectators to look up. Especially in multimedia shows this effect sometimes is used to enable the stage crew to change settings in the lower front area whilst people are looking at the water fountains. 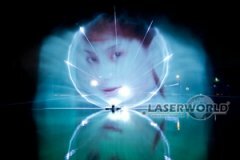 As they generate a lot of spray, the laser beams can be easily visualized in a certain area. They can also emphase the water column by projecting patterns or color elements onto it. A special jet nozzle together with a strong pump generate the water fountain effect. The possible maximum height of the fountain depends on the diametre and shape of the jet nozzle as well as on the power of the pump. Everybody knows the little water sprout fountains in parks and gardens. 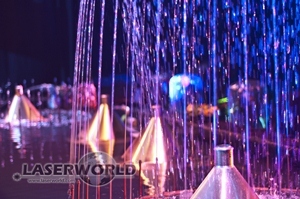 But there are also professional water sprout fountain solutions, that can be remote controlled and integrated in complete multimedia and light shows: These systems have variable pump solutions, that can be controlled by DMX and thus can easily be integrated in the whole show. Water sprout fountains consist of a line, circle or other skhape of nozzles in certain distances to each other, which are attached to the main water supply that comes from the pump. 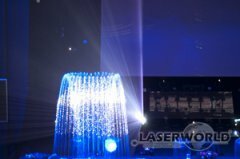 Depending on the pump strength and the nozzle size it is possible to create complete water walls from bottom upwards or slightly dense water effects that lasers can project on. Video projections on water sprout fountains usually make no sense, whereas lasers can generate astonishing effects. If you want to go for a water show effect in combination with video and/or laser, please don't hesitate to ask us: We have a multitude of different solutions and options for your individual project. 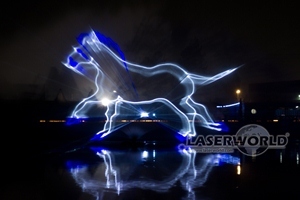 We would be glad to help you from the initial draft to the implemented multimedia show.